President Trump could deal the landmark Paris climate agreement a massive blow this week. The U.S. president is huddling with advisers on Tuesday to explore whether he should yank America from the international accord aimed at slowing global warming. But some powerful forces -- with real skin in the game -- are urging Trump not to abandon the 2015 Paris deal brokered among more than 175 nations. Surprisingly, it's the big oil companies who are vocally supporting the climate agreement, joining others in the administration that include Secretary of State Rex Tillerson, Ivanka Trump and her husband Jared Kushner. Specifically, ExxonMobil, Chevron, Royal Dutch Shell and BP are all in favor of America staying in the Paris COP21 pact, which former President Obama hailed as "the moment that we finally decided to save our planet." "We believe it's possible to provide the energy the world needs while also addressing the climate challenge," BP said. Chevron (CVX) told CNNMoney it "supports continuing with" the Paris deal because it "offers a first step towards a global framework." Exxon (XOM), the biggest US oil company that Tillerson used to lead, sent a letter to the White House last month hailing the Paris agreement as an "effective framework for addressing the risks of climate change." A Shell (RDSA) spokesman confirmed that the energy giant remains "strongly in favor" of the Paris deal. At first glance, it might seem surprising to hear that Big Oil isn't seizing on the shifting political environment to poke holes in a deal that undermines fossil fuels like crude oil. 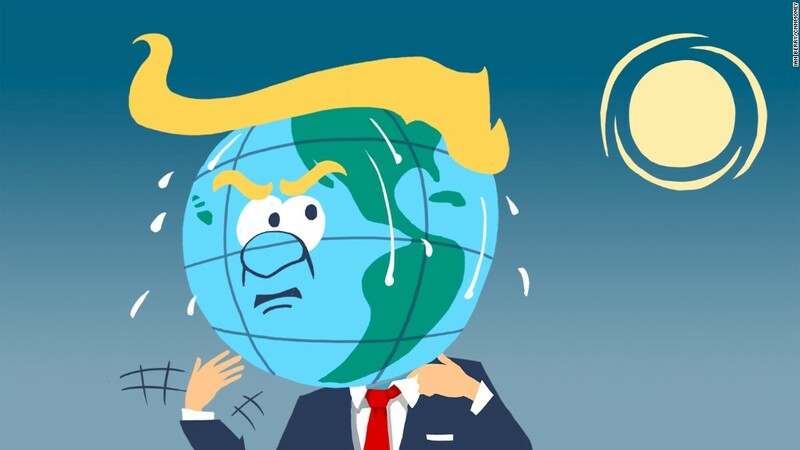 After all, Trump himself has called climate change a "hoax" and blasted COP21 as a "bad deal" for the U.S. (Trump later told The New York Times he has an "open mind" about the agreement). But these traditional energy companies have a vested financial interest in the Paris deal. That's because COP21's crack down on carbon emissions favors natural gas, which emits much less pollution than coal. While Exxon, BP and Shell are primarily identified as oil companies, they are actually diversified energy firms that rely heavily on natural gas to make money. For instance, 42% of Exxon's total daily production last quarter was actually in natural gas, according to FactSet. BP and Shell also lean on natural gas for a large chunk of their output. "These companies view natural gas as a key growth area going forward for them. It just makes sense for them to be at the table," said Brian Youngberg, senior energy analyst at Edward Jones. Natural gas production has soared over the past decade, thanks to the abundance of shale gas in North America. And now there's the added benefit that governments are cracking down on carbon emissions. BP's statement mentioned its commitment to "reducing emissions in the power sector by producing and marketing natural gas." And Shell needs to protect its massive $50 billion investment last year to acquire BG Group, a sizable producer of natural gas. Shell put out a report in February predicting that demand for liquefied natural gas (LNG) -- natural gas that is turned into a liquid to ship it where it's needed -- will jump by 4% to 5% each year to 2030. The report highlighted that governments like that natural gas produces half the greenhouse gas emissions that coal does when it's burnt to produce electricity. "You're going to see extreme growth in LNG," Youngberg said. Cheap natural gas -- not tough environmental regulations -- has been the leading cause of the demise of coal. Still, last month Trump tried to provide the badly struggling coal industry a boost by starting to undo Obama's Clean Power Plan that aimed to cut carbon emissions by power utilities, one of the largest sources of greenhouse gases. Cheniere Energy, (LNG) a natural gas company, sent the White House a letter on Monday describing the Paris agreement in terms that would fit Trump's America First ethos. The Paris accord is a "useful instrument for fostering demand for America's energy resources and supporting the continued growth of American industry," Cheniere wrote.